To avoid the use of Macrophages cell lines, we work with human macrophages derived from blood monocytes and mouse Macrophages derived from bone marrow. We have obtained 3D matrices with variable architecture, composition and viscoelastic properties in order to mimic the tissue diversity and to determine whether these parameters influence the migration of macrophages. We have reported that human Macrophages are able to use two migration modes depending on the matrix architecture. In porous matrices like fibrillar collagen I, macrophages, as with all leukocytes, use the amoeboid migration mode characterized by a round cell shape, a high velocity, dependency on the kinase ROCK and non-involvement of matrix proteolysis . In dense, poorly porous matrices such as Matrigel and collagen I polymerized as a gel, macrophages use the mesenchymal mode. It is characterized by an elongated cell shape, a high directionality, a slow velocity, and a requirement of proteases to create their path. ROCK activation is not required in this process . In contrast, ROCK inhibition by the cytoplasmic form of the cyclin-dependent kinase inhibitor p27kip1 favours the mesenchymal mode, and in vivo, macrophages depleted for p27kip1 fail to infiltrate lung tumors . The ability of resident, M1-/M2-polarized and thioglycollate-elicited peritoneal macrophages to migrate through these various matrices has been examined. We observed that only M2-polarized and elicited macrophages can adopt the mesenchymal mode . Spheroids of 0.5 mm in diameter were obtained by 3D culture of breast cancer cells which secrete several extracellular matrix (ECM) proteins that participate in the cohesion of the spheroids. These spheroids therefore constitute a tissue-like model in which we studied the migration of macrophages [4, 5]. 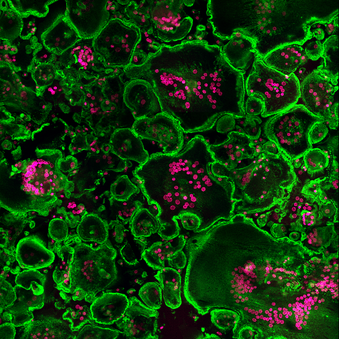 Macrophages use both the mesenchymal and amoeboid migration modes to infiltrate spheroids. When these structures are infiltrated by macrophages and then embedded in Matrigel, macrophages exert a mechanical action on the matrix to promote tumor cell invasion of the surrounding matrix. While matrix metalloproteases (MMP) are required for macrophage infiltration in spheroids , they are not significantly involved in migration in collagen or Matrigel which mostly require lysosomal proteins . Indeed, Cathepsins S, X and B were identified by another group who used our migration model and confirmed our data . Podosomes are F-actin rich cell adhesion structures which exert a proteolytic activity on the ECM that are constitutively formed in few cell types including macrophages. Until recently, podosomes have only been characterized in cells cultured in 2D. We observed that when macrophages perform mesenchymal migration, they form cell protrusions at the tip of which podosome marker proteins accumulate and co-localize with F-actin and proteolytic degradation of the ECM. Thus, we called these cell structures ‘3D-podosomes . They were not formed in macrophages using the amoeboid mode ; and therefore we hypothesized that 3D-podosomes could play a role in the protease-dependent mesenchymal mode. Actually, using several approaches, including siRNA and knock-out cells for podosome-regulating proteins, we showed that podosome alteration correlates with impaired mesenchymal migration but unaffected amoeboid migration [8, 9]. 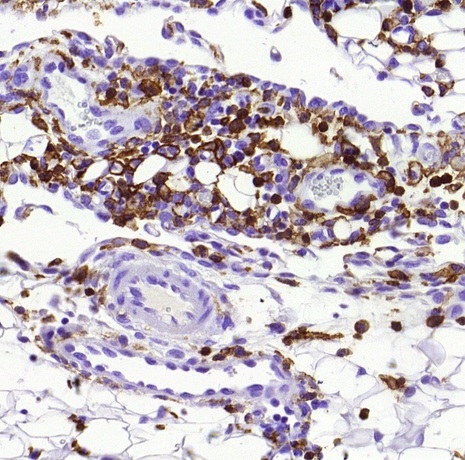 Hck is a tyrosine kinase of the Src family specifically expressed in phagocytes. We have shown that it regulates podosome formation, organization, stability and proteolytic activity [9-11]. Hck-/- macrophages have a pronounced defect in mesenchymal 3D migration but use WT-like amoeboid migration mode. In addition, recruitment of Hck-/- macrophages in the peritoneal cavity after thioglycollate (TG) injection is also diminished (8). In human macrophages, we have depleted Hck using a siRNA approach which efficiently down regulates protein expression in myeloid cells . Like in Hck-/- mouse macrophages, Hck-depleted human macrophages present a defective mesenchymal migration (Lastrucci et al, submitted). Nef is a HIV-1 protein which, among other effects, activates Hck in macrophages . We found that Nef-expressing macrophages present more stable podosomes and the matrix proteolytic activity is enhanced. As a result, the mesenchymal migration is enhanced . Thus Hck appears as a potential target to down-regulate tissue infiltration of macrophages in diseases in which macrophages play a detrimental role . We have extended this work by showing WASP as a downstream effector of Hck in the podosome formation pathway and mesenchymal migration . Filamin A (FlnA) is a ubiquitous protein which cross-links actin filaments and binds to membrane receptors including integrins. We showed that in macrophages, FlnA regulates the number and stability of podosomes, the ECM degradation and the mesenchymal migration but not the amoeboid migration . Therefore, the presence and functionality of podosomes appear to be a requisite for mesenchymal migration. 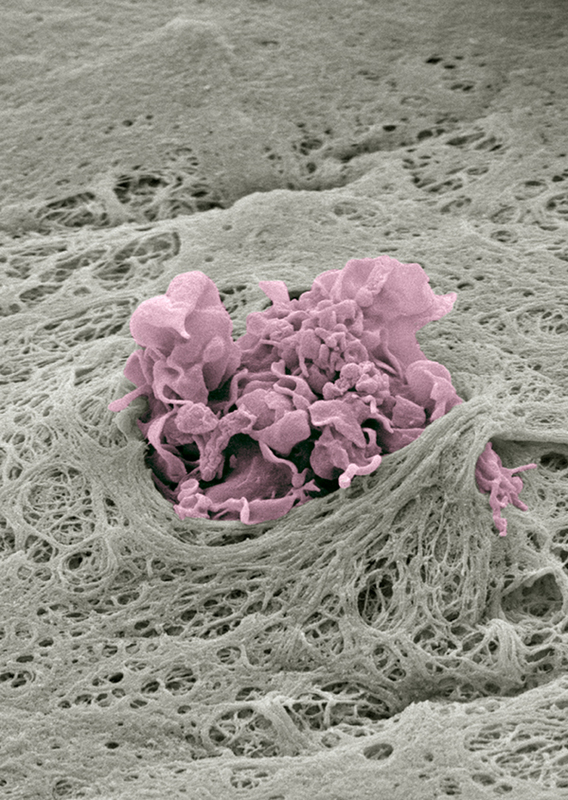 Macrophages are host cells for several pathogens including HIV-1 and Mycobacterium tuberculosis (Mtb). About 3 weeks after sexual transmission, HIV-1 disseminates in several organs. Both T cells and Macrophages have been proposed to be the virus carriers in that process . We observed that HIV-1 dramatically alters all macrophage migration modes, inhibiting the amoeboid migration and enhancing the protease-dependent mesenchymal mode, effects under the control of the viral protein Nef. In vivo, these observations translate into massive tissue infiltration of macrophages expressing Nef. Notably, Nef acts on podosomes and on proteins previously identified by the team as key molecular regulators of macrophage migration, including Hck (Hematopoeitic cell kinase) and WASP (Wiskott–Aldrich Syndrome protein) . Podosomes are mechanosensing structures that exert forces to the substratum by forming perpendicular protrusions into the surrounding matrix. To study these aspects, we collaborate with a physics group headed by C. Thibault to investigate the mechanical properties of podosomes. Using atomic force microscopy combined with immunofluorescence we determined the stiffness of the podosome core and showed that it features periodic oscillations (37 sec) regulated by acto-myosin activity . We have developed an original approach that consists in measuring, at the nanometer scale using an atomic force microscope, the deformations induced by human macrophage podosomes on an elastic film a few nanometers thick. Based on the measurements of the properties of this film and using a mechanical model adapted to the particular architecture of these adhesion structures, we were able to evaluate the amplitude of the protrusion forces implicated. Using this strategy, we could estimate, for the first time, the forces developed by individual podosomes and demonstrate that these forces are correlated to the film rigidity. We observed that these forces are oscillatory and varies in a synchronous manner for podosome first neighbors, a result that correlates with phase synchrony of core F-actin temporal oscillations. This dynamic spatial coordination between podosomes suggests a short-range interaction that regulates their mechanical activity. We have also determined that both actin polymerization and myosin II-mediated contractility are major players in the production of force at podosomes, and proposed a theoretical model based on the equilibrium between these two force generators proposes an explanation of the podosome oscillatory behavior [18, 19]. Finally, we recently provided an experimental proof that such a force balance exists. We inhibited the expression of several podosome ring components and studied the impact on podosome protrusive ability using atomic force microscopy. This approach showed that adhesion ring integrity is crucial for protrusive force generation at the core of the podosome. The adhesion ring would thus operate as a handle that transmits to the environment the force produced by the protrusive core. 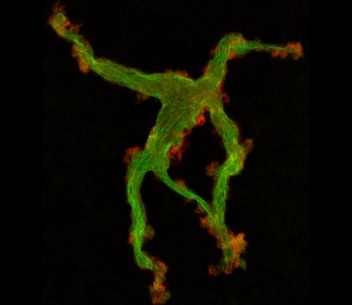 Using a tridimensional nanoscopy technique called DONALD, we revealed that talin, one of the ring components, is vertically stretched within a molecular scaffold that connects adhesion receptors to the cytoskeleton and contains vinculin and paxillin. Talin stretching increases as the podosome generates higher protrusive forces, which proves that the ring is subjected to mechanical tension. This fundamental result offers a new perspective on the workings of this structure developed by macrophages to migrate through dense environments . Podosomes are submicrometer structures that probe the stiffness of the extracellular environment. Left. Topography of a flexible membrane deformed by the podosomes of a macrophage (atomic force microscopy). Right. Architecture of the podosome ring (DONALD tridimensional nanoscopy); each vinculin molecule is colored according to its height with respect to the cell bottom (red to blue upwards). Van Goethem, E., et al., Matrix architecture dictates three-dimensional migration modes of human macrophages: differential involvement of proteases and podosome-like structures. J Immunol, 2010. 184(2): p. 1049-61. Gui, P., et al., Rho/ROCK pathway inhibition by the CDK inhibitor p27(kip1) participates in the onset of macrophage 3D-mesenchymal migration. J Cell Sci, 2014. 127(Pt 18): p. 4009-23. Cougoule, C., et al., Blood leukocytes and macrophages of various phenotypes have distinct abilities to form podosomes and to migrate in 3D environments. Eur J Cell Biol, 2012. 91(11-12): p. 938-49. Guiet, R., et al., The process of macrophage migration promotes matrix metalloproteinase-independent invasion by tumor cells. J Immunol, 2011. 187(7): p. 3806-14. Verollet, C., et al., Hck contributes to bone homeostasis by controlling the recruitment of osteoclast precursors. FASEB J, 2013. 27(9): p. 3608-18. Jevnikar, Z., et al., Three-dimensional invasion of macrophages is mediated by cysteine cathepsins in protrusive podosomes. Eur J Immunol, 2012. 42(12): p. 3429-41. Van Goethem, E., et al., Macrophage podosomes go 3D. Eur J Cell Biol, 2011. 90(2-3): p. 224-36. Guiet, R., et al., Macrophage mesenchymal migration requires podosome stabilization by filamin A. J Biol Chem, 2012. 287(16): p. 13051-62. Cougoule, C., et al., Three-dimensional migration of macrophages requires Hck for podosome organization and extracellular matrix proteolysis. Blood, 2010. 115(7): p. 1444-52. Cougoule, C., et al., Activation of the lysosome-associated p61Hck isoform triggers the biogenesis of podosomes. Traffic, 2005. 6(8): p. 682-694. Park, H., et al., Tyrosine phosphorylation of Wiskott-Aldrich syndrome protein (WASP) by Hck regulates macrophage function. J Biol Chem, 2014. 289(11): p. 7897-906. Troegeler, A., et al., An efficient siRNA-mediated gene silencing in primary human monocytes, dendritic cells and macrophages. Immunol Cell Biol, 2014. 92(8): p. 699-708. Verollet, C., et al., HIV-1 Nef triggers macrophage fusion in a p61Hck- and protease-dependent manner. J Immunol, 2010. 184(12): p. 7030-9. Verollet, C., et al., HIV-1 reprograms the migration of macrophages. Blood, 2014. Maridonneau-Parini, I., Control of macrophage 3D migration: a therapeutic challenge to limit tissue infiltration. Immunol Rev, 2014. 262(1): p. 216-31. Carter, C.A. and L.S. Ehrlich, Cell biology of HIV-1 infection of macrophages. Annu Rev Microbiol, 2008. 62: p. 425-43. 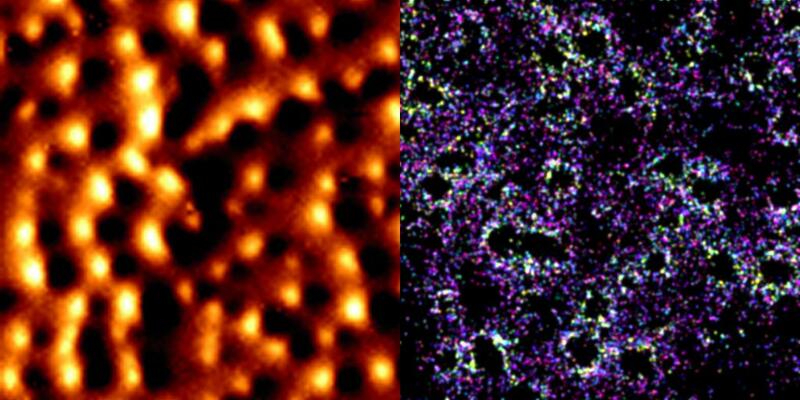 Labernadie, A., et al., Dynamics of podosome stiffness revealed by atomic force microscopy. Proc Natl Acad Sci U S A, 2010. 107(49): p. 21016-21. Labernadie, A., et al., Protrusion force microscopy reveals oscillatory force generation and mechanosensing activity of human macrophage podosomes. Nat Commun, 2014. 5: p. 5343. Proag, A., et al., Working Together: Spatial Synchrony in the Force and Actin Dynamics of Podosome First Neighbors. ACS Nano, 2015. 9(4): p. 3800-3813. Bouissou, A., et al., Podosome Force Generation Machinery: A Local Balance between Protrusion at the Core and Traction at the Ring. ACS Nano, 2017.